Minchinhampton is a thriving small hilltop town on a tongue of high land between the 'Golden Valley' and the Nailsworth valley. Located in southern Gloucestershire 1.5 miles North East of Nailsworth. Situated on the eastern fringes of Minchinhampton Common, high above the valleys once prosperous with the production of cloth, this is a very attractive small Cotswold town. Centred on its High Street and old Market Square, the main features of which are the late 17th-century Market House supported on stone columns, the handsome Crown Hotel, and the Post Office, a genuine Queen Anne building. The interesting church has a truncated spire looking over the Market Square but at the same time stands aloof from it. The church was given Caen's Abbaye aux Dames by William the Conqueror, and then in 1415 passed to Syon Abbey, in whose hands it remained until the Dissolution. The present building dates from the 12th century and is full of interest. There are old cloth mills in the valleys to the south of Minchinhampton. here and, fourteen years ago, returned to live here. For good. which I feel I truly belong. 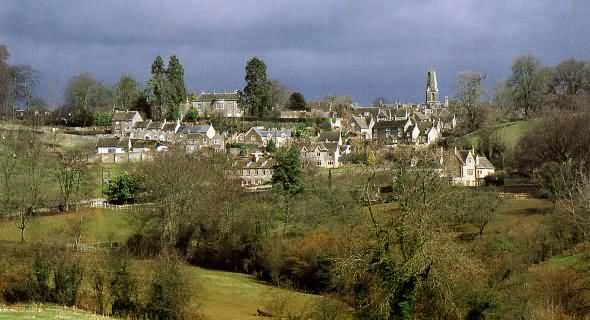 Minchinhampton is surrounded by common land high above the Chalford valley. The 600 acre Minchinhampton Common was granted to the people of the town in the 16th Century. The common has been owned and maintained by the National Trust since 1913. A long narrow street bordered by stone cottages leads to a compact centre clustered around a pillared market-house built in the 17th-century and given to the town in 1919 by the Lord of the Manor. Holy Trinity church is cruciform and has a distinctive truncated spire, part of which was demolished in 1563 because it was too heavy for the supporting arches. 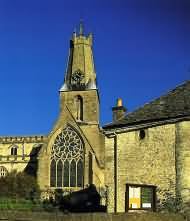 Although there has been a church here since Norman times, the oldest remaining parts of the present church are the 14th-century transepts and tower. The National Trust bought Minchinhampton Common before the second world war in order to control quarrying. Together with Rodborough Common it covers nearly 1000 acres of high open grassland and woods. It is bordered by a small group of weavers cottages and other more modern houses. The common is pockmarked with a variety of earthworks from Neolithic barrows and old quarries to modern day golf bunkers. Every alternate year, on the second Saturday in September, people descend on Minchinhampton to enjoy the Country Fayre. There is lots of entertainment and food, the streets are closed to traffic and filled with stalls selling all manner of things. The next Country Fayre will be on Saturday 12th September 2015. See our Cotswolds Calendar for further details. Coaley Peak Picnic Site - Includes the Frocester Hill viewpoint and the Nympsfield long barrow. Frocester Tithe Barn - 16th century tithe barn and also gate and court houses from same period. Minchinhampton Common - extensive open Common, the second largest in the Cotswolds, lies around the town of Minchinhampton with its typical cottages and 17th century wool market house supported on stone pillars. Hetty Pegler's Tump - English Heritage site of superb chambered long barrow. The Bulwarks - National Trust at Minchinhampton Common. Extensive earthworks and several long barrows on Cotswolds second largest common. Westonbirt Arboretum - for details click here. Eric Monk, who died aged 91 in 2013, founded the Society of Architectural Illustration (SAI) and was an authority on the history of keys and locks. His book 'Keys: Their History and Collection', published in 1974, remains in print and traces the earliest examples - simple wooden cylinders used in Ancient Egypt from around 4,000 BC - to the present day. For comprehensive walking guide see - www.escapetothecotswolds.org.uk/userfiles/file/walks/jubilee/minchinhampton-and-box.pdf.